Kirk had a surgery yesterday for the removal of a mammary tumor. The intervention went well and we all hope e had an early catch and it will not develop further complications. Ms M cuddled him a bit after the little brat, pardon me! I meant “sweet toddler”, went to bed, and he had some pellets. But still he prefers not to move and lais still in a pancake shape on the floor. Veggies don’t tempt him. The good news is that he poops and pees. Meanwhile, Ms M is going crazy. Although she knows his behaviour is normal, she would love to see him eating. (Losing some weight won’t harm him either. Au contraire!) Thanks all gods Mr G installed a web cam so she can check on Kirk from work. If caught and removed early, great chances for another few healthy years. Usually, metastasis is slow and goes to the lungs. If caugth early, chances are no metastasis would happen. He had an X-Ray which was clean. Anyway, on an X-Ray one can see only the tumors bigger than 0.5 cm. So a clean X-Ray doesn’t mean there is nothing there. And no worries, Kirk is on pain killers for the next days. We just think he suffer like a real man. Or at least we hope he will not get a major psychological trauma. It smells like hay spirit! Due to repeated issues with home deliveries via DHL, the HF decided to have the new order delivered at her office. I think she somehow underestimated the dimensions of the parcel and had the idea that it will be easy to transport home. Well, surprise, surprise! The parcel was delivered yesterday and it was huge. I mean really really huge. 10 kilos of hay, two bags of a special dry food to help Worf poop better and 4 packs of puppy pads can’t fit in a small box. You should have seen the face of the HF! She had to find a solution to store those things away from the eyes of her colleagues and guests from work. How could one justify the presence of so much hay in a lobby consultancy?! She managed somehow to fit everything under her desk and already brought home one pack of 5 kilos of hay, but the other one is still under her desk. And it smells. OK, it is not a bad smell. But it smells like hay in a place where there should be no hay. Hopefully no one will realise from where this comes from before the second pack of hay leaves the office this evening. The funny part was that she had to drag that pack of hay in a caddy and pass by the crèche to pick the little rascal too. Imagine how the other parents were looking at all that hay! I think some even asked themselves if the toddler was actually eating hay. And this is how the hay looks like under her desk. Sorry for the poor quality. So this is what I call dedication and a well-trained human servant! Our humans disappointed me… Again. But I should get used with it. Just because there are no perfect humans out there. After all, they are not Guinea Pigs! They left for Venice last week. With all the explosive hassle from Brussels, they went on with their holidays plan. Fine for me, we already said they are weird and need breaks. But they messed up our timetable. Big time! The worst part is that our humans were supposed to bring us some Hard Rock Café paper bags. Apparently they took them from the shop and stored them somewhere in the luggage. But they were nowhere to be found once they got home! So, just imagine this: they tell us that there are some bags for us and then, suddenly, there is none. Disappointing! Now, if you’ll excuse me, I’ll go be disappointed in my own wood house. We are apologising for our absence, but there is another bipod in the herd and we need to make sure she has a good start in life with a lot of guinea pig love around her. After all, she needs to be trained to be a good servant for us and what better way to do it than supervise the big bipeds in educating her?! This is the reason why we’ve been absent for more than 10 days, but we hope we’ll be back on regular basis asap. By the way, Data freaked out first time he heard her crying in the living room. 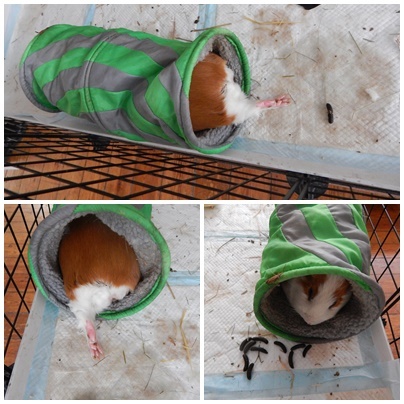 In the meanwhile, I let you with some photos of me having a hard life in the tunnel.